Chobe Game Lodge in Botswana has been blazing a trail for responsible tourism for over a decade. Pippa Jacks visits to find out how, and checks out other top safari properties. When Florence Kagosi decided she wanted to become a safari guide instead of going into fashion design, her family did not initially support her. Fourteen years ago, safari guiding in Botswana was an almost exclusively male profession, and they were anxious. Florence came to work at Chobe Game Lodge in 2004 as its first and only female guide. She was an instant hit, with many guests insisting that they only be guided by Florence. “I think it’s the more gentle and thoughtful nature of women, towards both their guests and the animals, that people enjoy,” she suggests. Since 2010, the lodge has boasted the only all-fehink it’s the more gentle and thoughtful nature of women, towards both their guests and the animals, that people enjoy,” she suggests. 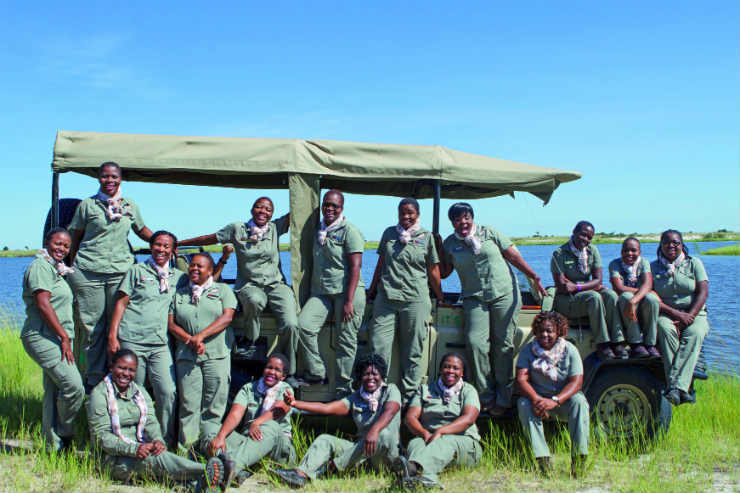 Since 2010, the lodge has boasted the only all-female guiding team in Botswana. Johan Bruwer, general manager, has been pleased to see the so-called “Chobe Angels” inspire other women to enter the profession. fficient design, and lies in a dry, remote and delicate environment within Chobe national park. This, along with its relatively large size, creates real challenges for reducing its impact. Since coming here 14 years ago, Bruwer has strived to improve in the areas within his control. All 870 light bulbs in the hotel are now LEDs, for example, and solar panels now supply almost 8% of the hotel’s power, with a new bank of panels to be installed soon, which will take it to 18%. 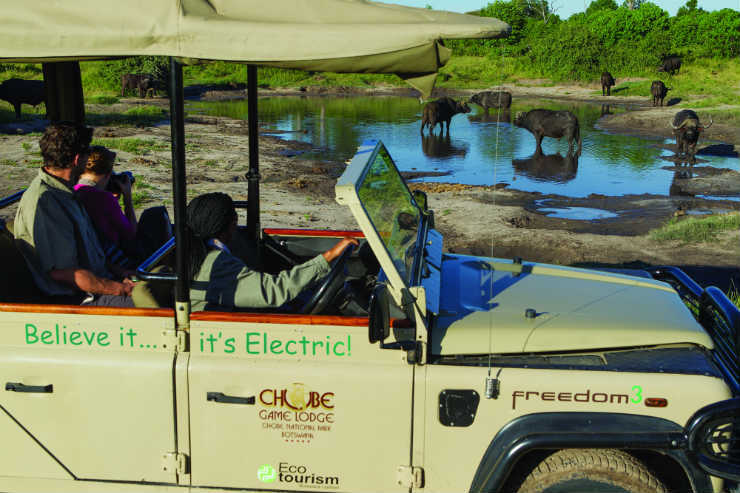 In 2014 it introduced electric safari vehicles and solar-powered river skimmers – the first in Africa – which saw it win in the World Responsible Tourism Awards at WTM London 2017. The safari vehicles aren’t only more eco-friendly;they also allow guests to get closer to animals without scaring them away and to experience the smells of the bush instead of exhaust fumes. The initial outlay is signifiicant ($35,000 per safari vehicle), but Bruwer notes: “With all the fantastic PR and the positive feedback from guests, we feel we got our return on investment the moment we bought them,” Bruwer notes. The hotel has leant upon its supply chain to help it achieve its goals, encouraging suppliers to take back their packaging, and a brewery to supply beer in glass bottles instead of tins. The boardwalk along the river is made of planks formed of recycled plastic, and the hotel sources produce locally as much as it is able to. New ideas aren’t always successful: a biogas plant was built but is temporarily on hold until a dedicated team is able to oversee its proper use. Bruwer has also had to compromise on bottled water: a borehole gives the hotel clean drinking water but many guests still request mineral water instead. “Some guests have asked why we don’t decant mineral water into reusable bottles but, for now at least, the practicalities of bottling and sanitising makes it unfeasible for a property of our size,” he says. On the topic of drinking water, as on air-conditioning and fluffy tumble-dried towels, Bruwer shares the frustrations of many ecoconscious hoteliers worldwide: while clients might say they value greenness, they are not keen to forego certain comforts. But challenges aside, Bruwer is keen to keep pushing forward, aiming to have 100% electric vehicles within the next few years and to enhance the hotel’s social and community programmes (it currently has 19 trainees from the local area, in response to an unemployment crisis). And what makes Chobe Game Lodge’s sustainability strategy particularly interesting is that, alongside a determination to protect the ecosystems that attract the tourists, to operate more frugally, and to do “the right thing”, sustainability has also become a key part of this hotel’s guest proposition. Chobe Game Lodge is situated on the Chobe River in the north-east of Chobe national park. It has 44 rooms – including several that interconnect – and has a Moroccan feel, with thick rugs, ceiling drapes and heavy doors. A programme of three game drives or river cruises per day is included, and in dry season the river banks throng with hundreds of elephants. It is larger and more hotel-like than some smaller camps, but a great choice for wheelchair users or those with children – and more affordable. It’s 90 minutes from Victoria Falls by road and 30 minutes from Kasane airport, so bush flights are not required. Book it: Prices start from £443pppn. Also in Chobe national park, but in the western Savute region, is Belmond’s newly revamped Savute Elephant Lodge. A permanent watering hole and viewing hide means guests can sit just metres from the action: one evening, more than 20 elephants were drinking at once. This five-star camp now includes a deck with a heated swimming pool and a telescope for stargazing. Incredible game drives treated me to a whole pride of lions, including playful cubs, and the only leopard of my trip. I loved the folklore stories, placed on the pillow each evening. Book it: Prices start from £750pppn. Eagle Island is Belmond’s Okavango Delta camp, where the terrain is entirely different, as it is flooded for half the year. Being a private reserve means guests can explore in different ways: by mokoro (canoe), horseback, helicopter, speedboat and on foot. The style is lavish compared with other camps, with black marble bathtubs and copper pipes and taps in the bathrooms. Suites are huge, with an infi nity plunge pool on the terrace. Big cats can be harder to see here when the water level is high, but on a relaxing barge cruise, I spotted hippos, fish eagles and elephants – with a glass of fizz in hand, of course. Book it: Prices start from £823pppn. Chief’s Island, home to Chief’s Camp, is one of the delta’s largest and richest in game. I was lucky to see both white and black rhino, while other game drives and mokoro trips yielded lions, three young cheetahs on the prowl, and a pack of wild dogs including puppies. The suites were the largest of my trip, with a freestanding bath, separate shower room and outdoor shower, and a huge decked area including a plunge pool. Book it: Prices start from £743pppn.